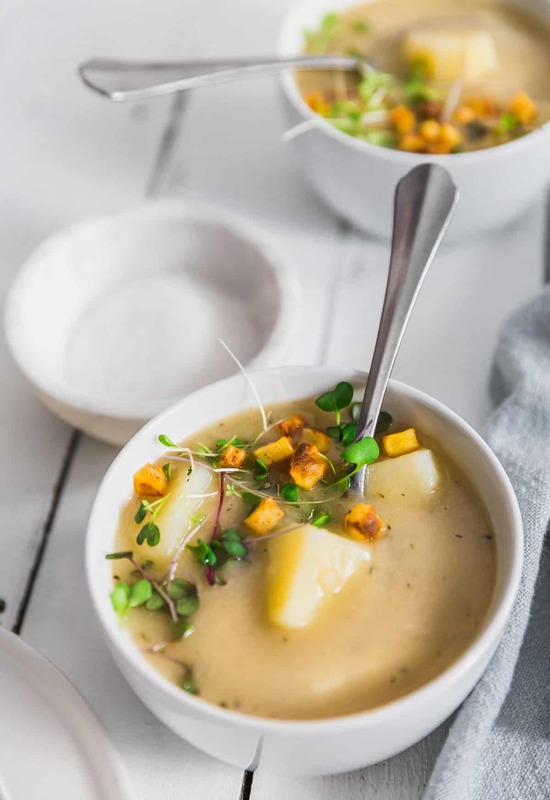 Incredibly flavorful and delicious, this lusciously Creamy Potato Soup is hearty and simple to make. 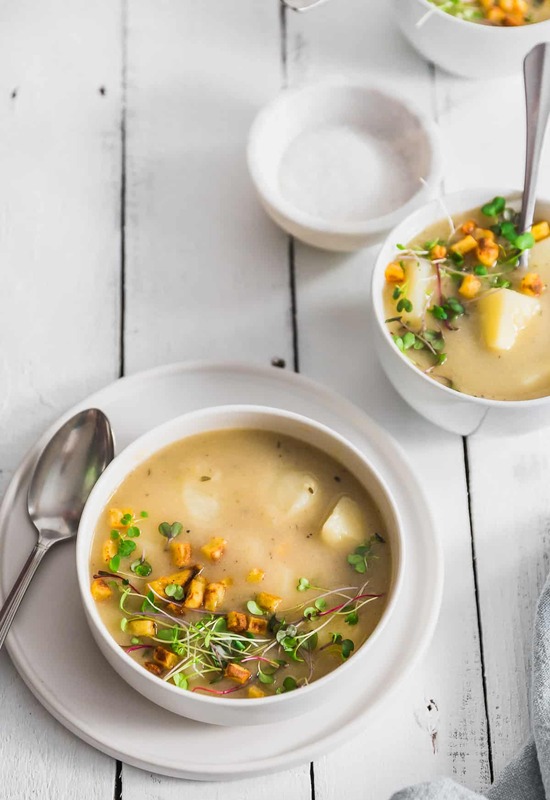 Perfectly smooth and seasoned just right, this dreamy potato soup is humble comfort food at its best, making it an ultimate Whole Food Plant Based soup. Vegan, no oil, no sugar, no highly processed ingredients, and gluten free. Mother Nature continues to play weather games with us in Ohio. Occasionally, the sun is shining brightly, teasing us that Spring is almost here, then she blasts us with hordes of snow the next. It’s like she knows we are all getting antsy and gives us little tiny glimpses of warmth and what is soon to come, then quickly switches gears, becomes temperamental. It’s like Mother Nature feels the need to remind us that she is indeed in control. I woke up this morning to a beautifully white winter wonderland. Yesterday, the grass was bright green and there was promise of Spring. Today, everything is coated in snow. The trees are glistening with tiny sparkles, with every branch pristine and white. It is quite beautiful, but it makes me want to hunker down and make soup. 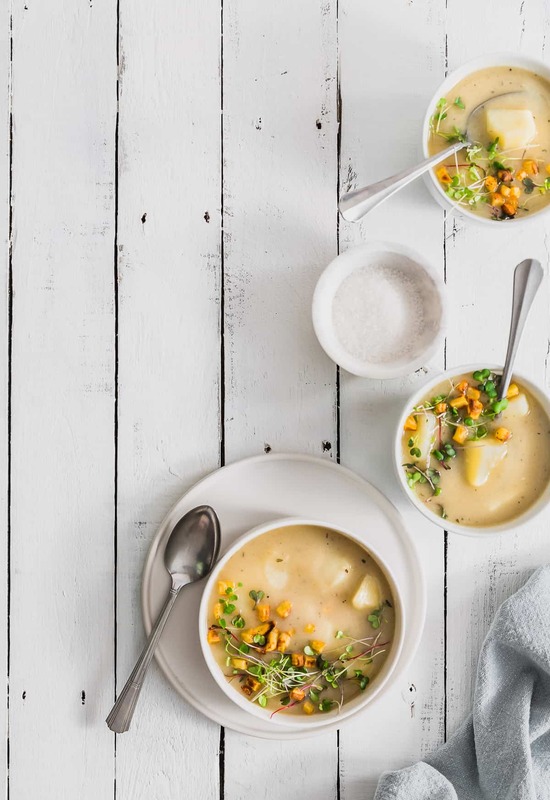 Snow and soup go hand-in-hand for me. Soup and mason jars also go hand-in-hand for me. I have a serious collection of Ball Mason Jars. I mean, I am not joking, I am a very serious collector. I put everything into them, grains, beans, pasta, you name it, if it fits (it sits), it goes into a half-gallon mason jar. I love to make soups and store them in jars. If you open our refrigerator, chances are you will see at least 2 or 3 jars of soup in there. They are perfect for soup food prepping since they are tall and hold a lot! I like to buy in bulk. It’s cheaper, and if you know you use a lot of a certain ingredient, it really is practical. We have a Food Saver. I use the wide-mouth mason jar attachment like my life depends on it. I love that thing. The regular mouth mason jar attachment, well, let’s just say that I’ve kicked it to the curb a long time ago. The wide mouth is where it’s at. I buy quinoa, lentils, all kinds of beans and grains in bulk, put them in my half-gallon mason jars, placed the lid on and seal it with the Food Saver and I am happy as a bug in a rug. Our Food Saver is actually Mikey’s, but I confiscated it once I realized that it had the wide-mouth mason jar attachment. Sorry Mikey! This recipe makes 11 cups of deliciousness. I put soup into a half gallon mason jar, minus what I set aside for dinner, and put a lid on it while the soup was still hot; it vacuum sealed itself. That way I get some extra life out of it in the fridge. Or you could just freeze the extra. I love doing this because there are days when I am just too tired to cook after a long tedious day of office work. Oh, and by-the-way, this is not a sponsored advertisement for mason jars and/or the Food Saver. We just love both products that much. 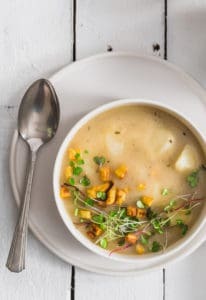 I love how creamy this soup is. 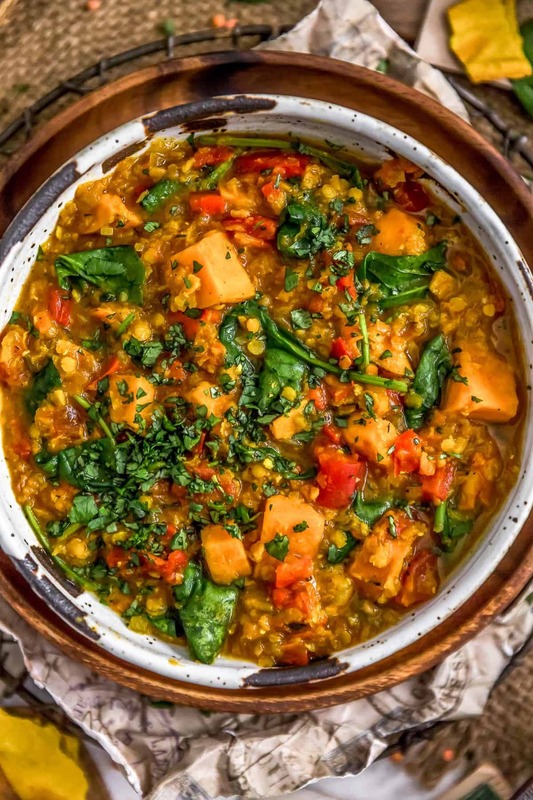 We kitchen tested it four times, just tweaking it here and there before landing on this yummy recipe. One of the fun things about this soup is the Crispy & Spicy Mini Oven-Fried Potato Topping. Mom and I really wanted to find a way to create some texture with this soup outside of the soup itself. We came up with this super yummy crispy and spicy mini oven-fried potatoes to compliment the creaminess of the soup. Think “very, very, tiny miniscule hash-brown potatoes” and you get the idea. 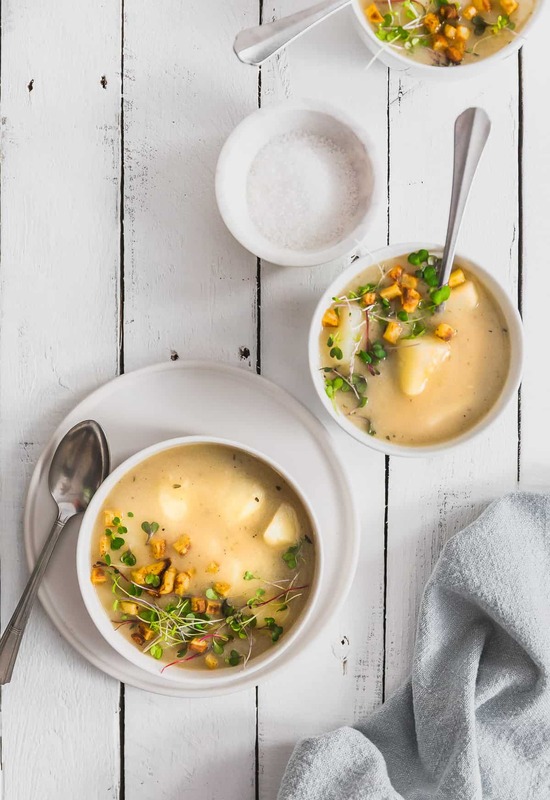 When we created these little yummy nuggets to put them on top of the potato soup, our biggest challenge was keeping Michael and Dad from eating them all before we got to shoot them. It was too funny. They wouldn’t keep their fingers out of them because they are really tasty on their own. But then add them to this soup, and they take the soup up another level of yumminess!!! Given them a try, it will put a smile on your face and will satisfy your tummy! Boiling water – just to cover the cashews; this water will be discarded later. In a large ceramic/enamel lined Dutch oven/pot or similarly large stockpot, add the diced onion and diced celery. Sauté over medium-high heat for 5 to 7 minutes until the veggies are tender. (If needed to prevent sticking, add a splash of vegetable broth or water). Sprinkle the flour over the sautéed veggies and cook the flour for one minute. The flour will get clumpy. Add the vegetable broth and water and bring to a boil. See recipe notes on vegetable broth. Add all the remaining ingredients except the unsweetened plant milk and cayenne pepper. Cook until the potatoes are just about done. Make the cashew cream and add to the pot. Then add the 2 cups of unsweetened plant milk to the pot. Increase the heat to boiling, the immediately lower to a simmer. 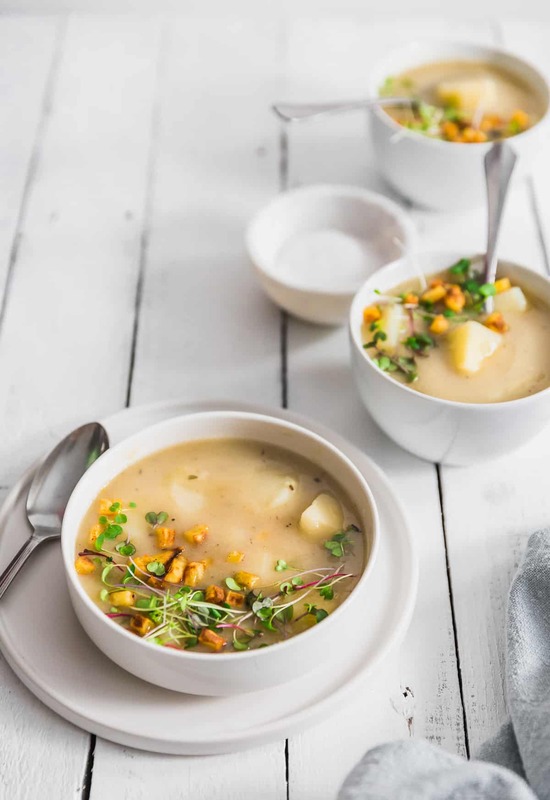 Once the potatoes are they are tender, remove approximately 1 ½ cups of cooked potatoes from the soup pot and manually mash with a potato masher or fork, then return to the pot. Add the cayenne pepper. Simmer for 3 minutes. Taste test the soup flavor. This is the time you can adjust the flavor, if needed. Increase seasonings, if desired, to suit your personal preferences. Simmer for another 3 minutes and serve. Line a large 14 x 20 baking sheet with parchment paper. Peel and cube the russet potatoes into 1/8thinch tiny cubes and place in cold water as you go. Drain and rinse the tiny cubed potatoes, then place in a medium sized bowl. Sprinkle the cubed potatoes with the spice ingredients and mix well to evenly coat the cubed potatoes. (Not too much, and not too little, you want them spicy). Dump the spiced potatoes onto the parchment paper lined baking sheet and spread them out so they have room to breathe on all sides. Bake for 15 minutes at 400 F.
Switch the oven to high broil and move the oven rack to an upper rack and broil until nicely browned. Remove the pan and taste test one to see if it is tender and crispy. If not, return to the oven and continue broiling until the potatoes are tender and crispy. When you remove them from the oven, sprinkle with a tiny bit extra sea salt and toss on the pan.Serve them as a topper on the potato soup. *Vegetable Stock: We use Pacific Organic Vegetable Stock. 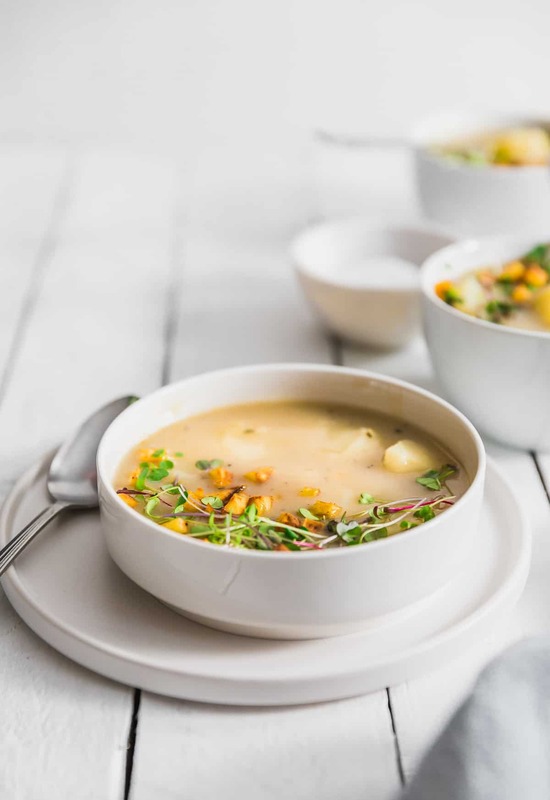 We love this brand because it is Whole Food Plant Based compliant, as it does not contain MSG, has no oil, and does not contain any highly-processed ingredients; however, this brand of vegetable stock does have a strong flavor so less broth is required when compared to the water ratio. We use a higher water to broth ratio because of this. If you are using a brand other than Pacific vegetable broth, then consider adjusting the water/vegetable broth ratio accordingly. 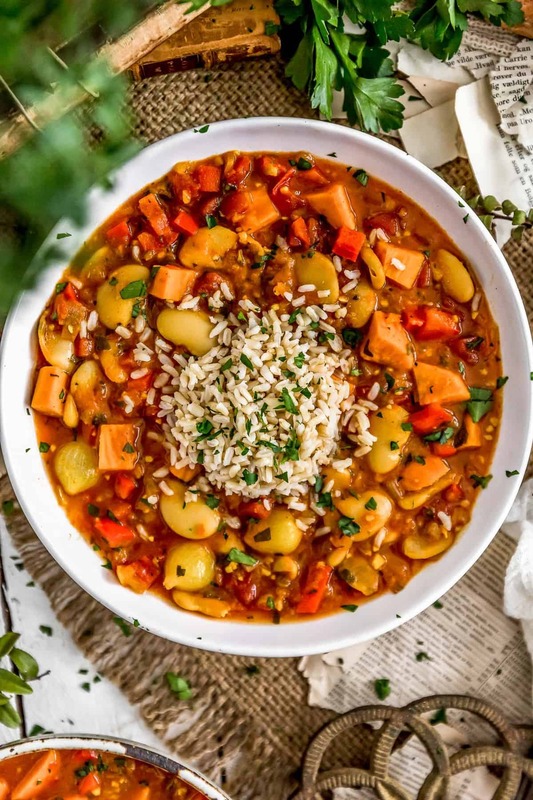 For example, if you are using a very mellow vegetable broth, you might consider 4 cups of vegetable broth and 1 1/4 cups of water for this recipe. 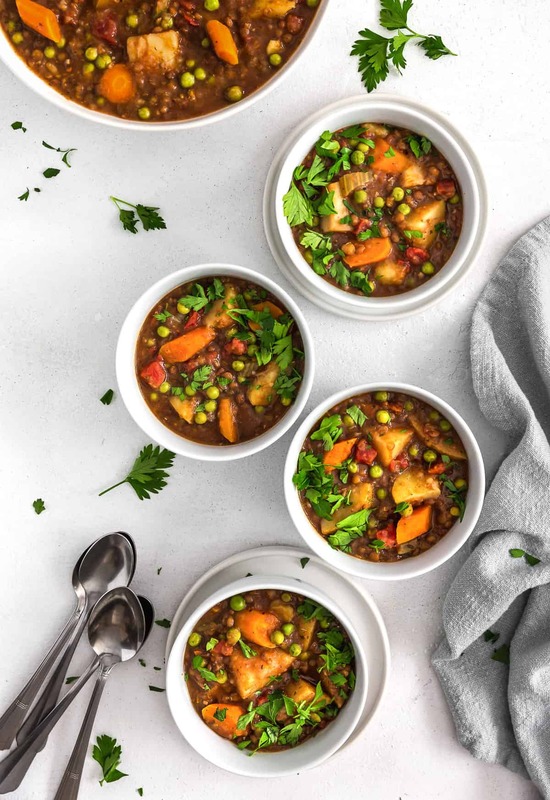 Please adjust the recipe (broth/water ratio) accordingly based upon the vegetable broth brand used if using other than Pacific Organic Vegetable Stock. *Sea Salt: Sea salt is based on personal preference. 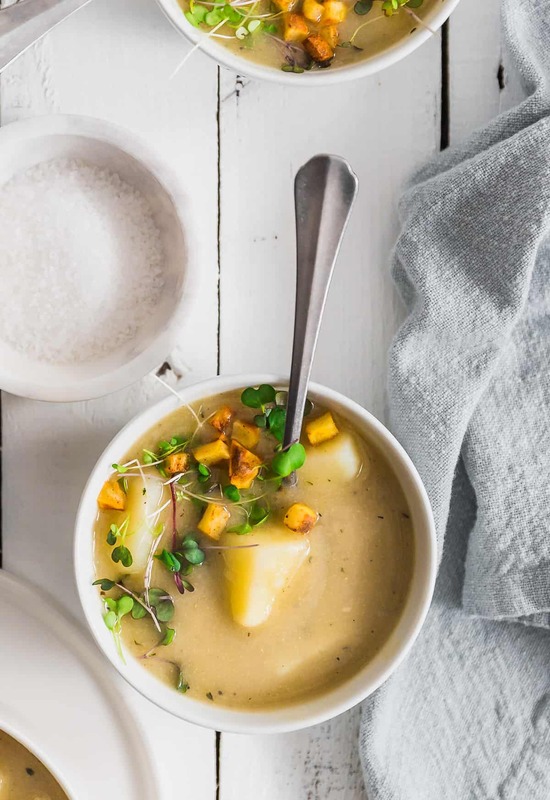 We added two additional teaspoons of sea salt to this soup.